7 Things I’ve learnt from Being a Mum Again | Call Me Mummy!! I know this is something everyone says but it truly rings home now. Junior is 11 months old already! I still vividly remember having a water birth with him like yesterday! They truly grow up so fast so enjoy every moment of it. With Aj I was marking down milestones like no man’s business! Her first smile, laugh, food, tooth, etc, and just making sure she was hitting them, if she missed something by a couple of weeks I would panic! With Junior I am so much more chilled out. When it comes, it comes and in the meantime, enjoy every moment. With Aj, I was so worried about forming bad habits like co-sleeping, napping on me or being carried all the time and loads of other little things. But I’ve learnt that babies form habits and habits can be broken. Now, the important thing for me with ‘habits’ is I’m happy with that ‘habit’ in the now. Like Homer Simpson would say, Future Tola will handle that, but for now enjoy every moment, including getting in extra cuddles. 4. Instincts – I still know best – even if I’m not sure! Sometimes I just want to try something because my instincts tell me to try it. I might be wrong and I might be right but so be it – its my decision and I am the mother! Obviously, I’ll take people’s opinions on board but the final decision will mine (and hubby’s of course :)). This is tied into the no 3. Most times it’s great having a routine in place but keep it simple! Sometimes it also easier to just wing it and be flexible while still keeping it simple. A classic example is when I’m doing Aj’s hair – I really want to do lovely braids and weaves but my daughter will have none of it so most times I just keep it simple! What worked for Aj hasn’t always worked for Junior and vice versa. So everyday is still a school day and I’m learning not to compare my babies or expect them to react to things the same way. It’s times like this I’m especially thankful I have a girl and boy so its harder for me to compare! 7. Enjoy it! Baby stage really is easier! Like I’ve been saying, I truly have been blessed with a ‘gentleman’ as grandpa calls him. However, his sister is another story! I love that girl to bits, but my goodness she already knows how to push my buttons! Lord please let her chill out before she get to the teenage years or else I’m in trouble! 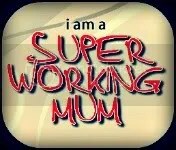 It’s not easy being a mum, but its amazing! I’m thankful to God each and everyday for these little ones and just ask for the strength and willpower to do right by them always! What have you learnt being a mum, first, second or third time?